» VeganMoFo: I hope you have your fat pants ready. Don’t Eat Off The Sidewalk! VeganMoFo: I hope you have your fat pants ready. IMPORTANT EDIT: If you are going to publish this recipe on your blog, or submit it to a recipe site, please give me credit and a link back. I forgot to MoFo yesterday. So i’m going to do two today. And the first one is going to distract you from the fact that I forgot to do it yesterday. Later I will blog about whatever I eat for dinner, which will basically be the first real meal i’ve eaten in days. It’s amazing what passes for an acceptable dinner when you’re knee-high in papers and envelopes. Anyway. So, I love Thanksgiving. A lot. It’s a sick and twisted cycle and pretty much every year I end the day wanted to shoot everyone in the face, but by the time September of the next year rolls around, i’m excited and planning the menu again. Occasionally I come across a recipe and bookmark it into my ‘thanksgiving’ folder in case I decide to make it. 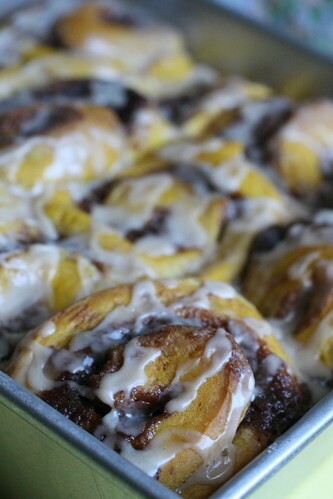 Sometime earlier this year, I came across a recipe from Cooking Light for pumpkin cinnamon rolls. As you all know, I ended up veganizing it for the zine. But I also added some spices, completely re-wrote the directions because I found the original ones to be confusing as hell, and the testers helped me determine that it needed more pumpkin. So I think we made it a better recipe overall. Now, this recipe is long and involved so it might seem scary. But it’s not! You just have to let the dough rise several times. So while it technically takes hours from start to finish, the actual work you put into isn’t that much. I had never made my own cinnamon rolls before and even I found it to be pretty easy, in the end. Save it for a lazy Sunday, read a book or clean your house in between risings. Either way, you should make these because everyone deserves homemade cinnamon rolls at least once. No, the ones out of a can don’t count! I’m stealing Isa’s picture because it’s better than mine. In a large bowl, combine the warm water with the yeast and whisk together with a fork, let stand for 5 minutes. Add the pumpkin, milk, melted margarine, and sugar in with the yeast, and lightly mix. Sift in the first two and a half cups of flour, salt, cinnamon, nutmeg, and ginger, and beat with a mixer at medium speed until smooth. Turn dough out onto a floured surface. Take the remaining 3/4 cup of flour and use it to flour the top of the dough and your surface a tablespoon at a time, as needed to keep the dough from getting sticky as you knead it. Knead the dough for about ten minutes, the dough will be elastic but soft and still a little sticky to the touch without being floured. Place the dough in a large bowl coated with oil, turning to coat the top. Cover and let rise in a warm place (85°), free from drafts, for 45 minutes or until doubled in size. Punch the dough down; cover and let rest for 5 minutes. Combine the sugar, brown sugar, flour, and cinnamon in a small bowl. Cut in margarine with a fork until mixture resembles coarse meal. Roll the dough into a 12 x 10-inch rectangle on a floured surface. Sprinkle with brown sugar mixture. Roll up the rectangle tightly, from the long side, pinch seam and ends to seal. Cut roll into 12 (1-inch) slices. Place the slices in a 9-inch square or round baking pan coated with cooking spray. Cover and let rise 25 minutes or until doubled in size. Bake the rolls for 20 minutes or until golden brown. Cool for 15 minutes in pan on a wire rack. Sift the powdered sugar into a small bowl. Add the water and vanilla, and whisk until smooth. It should be thick, but easy to drizzle. If it’s too thick, add another 1/2 teaspoon of water.